I came across this recipe for a gluten free pizza crust made with cauliflower and I had to give it a try. I love pizza but I can't have it because I have celiac disease and I can't have any type of gluten. 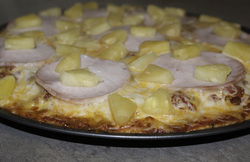 The photograph to the left is my first attempt at making this pizza. I used this blog post from DAMY Health as a guide and came up with my own variation of the recipe. You can taste the cauliflower flavor (which I love) but it still tastes just like pizza – cheesy and delicious. The edges of the crust even get a little crunchy like regular pizza does. So yes, pizza CAN BE healthy! If you cut this crust into 8 slices, each piece of crust (without toppings) has only 50 calories, 2 carbs and 5 grams of protein! There’s no need to feel guilty about eating a few slices, and most of all it's gluten free.